Very are and very beautiful, 1860's Civil War Bronze Service Medal issued by the State of West Virginia and identified to African American Private Philip Slaughter of the 45th Regiment, United States Colored Troops! This outstanding, USCT Civil War Service Medal measures approx. 1 1/2 in diameter with an affixed bronze hanger at the top. The obverse features a central image of Lady Liberty crowning a Civil War Soldier with a laurel wreath and presenting to the soldier a scroll form document. The figures are flanked by planted wheat on the left and a federal eagle on the right. The figures stand upon a platform beneath which there is the Coat of Arms of the state of West Virginia flanked by the dates "1861" and "1865". The reverse features an open laurel wreath with enclosed text that reads "Presented by the State of West Virginia". Demorest of New York City - can be found below at the bottom below the laurel wreath. The edge of each Medal struck by the State of West Virginia was struck with the name of the soldier to whom it was presented and included the Regiment in which the Soldier served. What makes this example especially important is the fact that it was presented to an African American Civil War Soldier!! Stamped text on the edge of the Medal reads Philip Slaughter 45th Reg U. The 45th Regiment, USCT was formed from troops accredited to Pennsylvania, and assembled at Camp William Penn, during the summer of 1864. Early in July, and when only four companies were full, the enemy under General Early, advanced into Maryland, and approaching Washington, assumed a threatening attitude. These four companies were, accordingly, hurried away to the Capital, under command of Captain Wilhelm Von Bechtold, and were assigned to a provisional brigade, commanded by General Casey, in charge of the defenses of the city. By him they were placed on garrison duty at Arlington Heights, where they remained until the middle of March, 1865. They were on duty in the city on the occasion of the second inauguration of President Lincoln, the only colored troops in the procession. In the meantime, the remaining six companies were organized at Camp William Penn, and a regimental organization was effected with the following field officers: Ulysses Doubleday, Colonel; Edward Thorn, Lieutenant Colonel; and James T. On the 20th of September, these companies, under command of Major Bates, proceeded to City Point, where they were assigned to duty in the Tenth Corps, commanded by General Birney, then occupying a position in front of Petersburg. Soon after the arrival of the command, the Tenth Corps was sent to the north side of the James River, with which it took part in the engagements of the 29th and 30th of September, and the 1st of October, at Fort Harrison. On the 8th, it was placed in the Second Brigade, commanded by Colonel Doubleday, of the Third Division commanded by General William Birney. On the 13th, it participated in the action at Darbytown Road, and on the 27th at Charles City Cross Roads. It was soon afterwards placed in winter-quarters, and until the opening of the spring campaign, was engaged in fatigue and picket duty, in front of Fort Harrison. Upon the formation of the Twenty-fifth Corps, it was assigned to the Second Brigade, of the Second Division, and on the 11th of March, Colonel Doubleday was promoted to Brigadier General. The four companies which had been on duty in the defenses of Washington, were, on the 14th of March, 1865, united with the other companies at the front. On the 26th, the corps was reviewed by President Lincoln and General Grant, and on the following day crossed the James, for active duty with the army of the Potomac. With the forces of that army, the regiment participated in the fighting at Hatcher's Run, and in that before Petersburg, on 30th, and 1st and 2d of April, losing in the engagements, one killed and eleven wounded, and entering Petersburg, with the victorious forces on the 3d. With the corps, it joined in the pursuit of the rebel army, passing through Braklesville, and Farmville, to Appomattox Court House, where it was present at the capitulation on the 9th. In May, it was sent with General Weitzel's forces to Texas, and was stationed at Edinburg, on the Mexican frontier. On the 8th of September, it was ordered to Brownsville, where it was mustered out of service on the 4th of November, and returning to Philadelphia, was paid and discharged at Camp Cadwalader, on the 13th of December. While there are two Privates named Slaughter listed on one of the Rosters of the 45th USCT, Philip Slaughter is not listed there although we are confident that further research will uncover the history of the Black Civil War Soldier to whom this Service Medal was awarded. 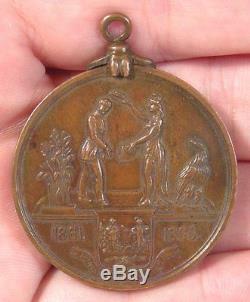 This beautiful and original, Bronze Civil War Service Medal is in very good, original condition. The casting is sharp and strong and bold and there is only light wear to the highest spots. The Medal was originally issued with a rather simple bar pin and a silk, flag form ribbon backing and these two elements are not present. A very rare and wonderful, 1860's Civil War Bronze Service Medal issued by the State of West Virginia and identified to African American Private Philip Slaughter of the 45th Regiment, United States Colored Troops and a fantastic addition to any collection!! And Click Here to Add Us To Your Favorite Sellers List. Click Here to Discover More About this Item and Many Others on Our New Informational / Non-Commercial / Reference Blog - Walnutts. The item "1860's CIVIL WAR BRONZE SERVICE MEDAL AFRICAN AMERICAN SOLDIER US COLORED TROOPS" is in sale since Friday, July 24, 2015. This item is in the category "Collectibles\Militaria\Civil War (1861-65)\Original Period Items\Medals, Pins & Ribbons".